This experiment is for Advanced Students. For ages, people have been hurling rocks, sticks, and other objects through the air. The trebuchet came around during the Middle Ages as a way to break through the massive defenses of castles and cities. It’s basically a gigantic sling that uses a lever arm to quickly speed up the rocks before letting go. 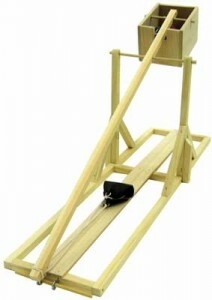 A trebuchet is typically more accurate than a catapult, and won’t knock your kid’s teeth out while they try to load it. Trebuchets are really levers in action. You’ll find a fulcrum carefully positioned so that a small motion near the weight transforms into a huge swinging motion near the sling. Some mis-named trebuchets are really ‘torsion engines’, and you can tell the difference because the torsion engine uses the energy stored in twisted rope or twine (or animal sinew) to launch objects, whereas true trebuchets use heavy counterweights. Sorry for the delayed response! Which one did you have a specific question about? I am happy to help answer any questions you have – just let me know where you are getting stuck. For future math problems in the high school section, you’ll find homework sets that have fully detailed solutions written out so you can easily follow along and understand how the solution works. Hi:) I need help with the math on the worksheet unfortunately! Do you have somewhere you walk us through this? Also, with the rest of the math in the other experiments, do you usually go through it with the students? Thank you! wow! i want the movie now! It’s okay now but that sort of thing keeps happening to me today on e-science. The trebuchet instructions are on the video on this page. We only have instructions for this project on e-Science (it’s not on any DVDs), and the documentation (worksheet) link is right under the video. The video stopped and I had to go back a little. Haven’t built it yet but have all the supplies. Looks Fun! Wow! This project turned out perfect!! The kids are chucking marshmallows all over the room (we made two of these) and we also made forts out of bedsheets to go with it. Thanks for such a fun project!! Soon… I promise. The honest truth is that I whacked the camera during the final stages of testing and it had to be sent off to the repair shop. It just arrived back today and we’ll have to see how much of the video was recovered. So sorry for the delay! When will the movie go up?